Who doesn’t want a game plan? Something to map out what exactly is going to be done and why? It’s just a smart idea. After your internet marketing company has talked with you about your goals and current situation they should take a deep dive into your company’s website, PPC account, opportunities, etc., depending on what you’ve hired them for, and perform a professional analysis. They should finish with a list of what needs to be done and how it can be accomplished. Last they should compile that information in a plan format, making it easy to read, understand and execute. You may have discussed goals and objectives with your internet marketing company but how do you know they really understand? Having them create a campaign development will make that very clear! If a goal was miscommunicated or misunderstood, you’ll know as soon as you read the plan. This makes it easy to steer things back in the right direction at the beginning while it’s easy to redefine goals and expectations. 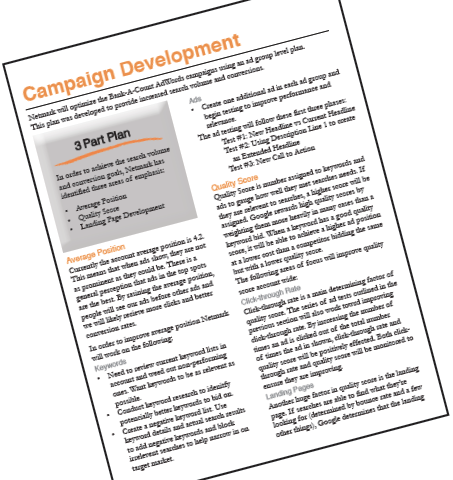 A good campaign development always outlines a time frame for when each task will be done and when goals should be met. It’s easy to stay on the same page with your internet marketing team when you know exactly what work is being done and when. Of course things will come up and additional items will be added or taken off the list, but having a basic understanding of exactly what you’re paying for can help unify marketing efforts. During the campaign development process your internet marketing company will identify areas where there may be issues you weren’t aware of and where industry best practices have not been followed. It is important that internet marketing companies take time to thoroughly evaluate your marketing strategies in order to find and plan to fix any “black-hat” (or even gray-hat) tactics you may be using. It won’t always be anything big but any quick fixes to get up to industry best practices will be worth it. You want a company who know the rules and best practices. As we’ve seen time and again, trying to work the system may work short term, but will hurt you in the end. For internet marketing, playing by the rules will always be the smart way to go. 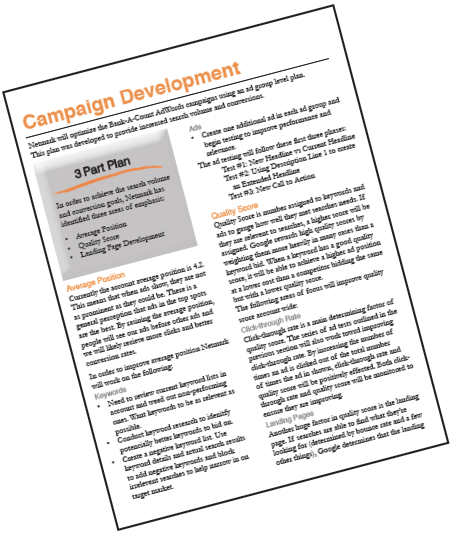 Rethink asking you internet marketing company to skip campaign development and if they’re not doing one, ask them to! The time it takes to put one together will be worth all the effort and more as everyone will have a clear understanding of the goals and plan to get there.